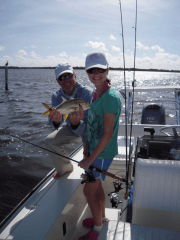 Fishing in Sanibel and Fort Myers with a charter guide for Snook, Redfish and Tarpon has been pretty good lately but other species are also a recipe for a great day on the water. So is the case lately when Mick (Dad) and Katie (Daughter) decided to take a day off the beach and spend it on the water. The day started out by being welcomed by some Dolphin leading us to the fishing grounds. After some hit and misses we ended up at a spot where we can usually catch a few but this day the bite was on. Katie was reeling them in as fast as I could unhook them and Dad took the back seat watching her and forgetting that this is a competitive girl and she’s keeping record of the score. 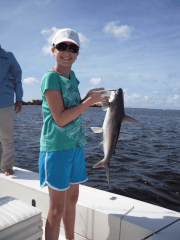 There were Mangrove Snapper, Jack Crevalle, Ladyfish, Speckled Sea Trout and her favorite the Topsail Catfish (it was the biggest and pulled the best). We ended up spending the whole charter fishing this one spot and had a great time. Everyone that knows me and reads my blog understands my favorite day of fishing is when a parent takes their kid out for a day of fishing. It brings back memories of my dad taking time out to get me and my sister hooked on fishing. Below is a part of an email sent by Katie after our great day on the water. Tight lines Katie and hope to see you next year! 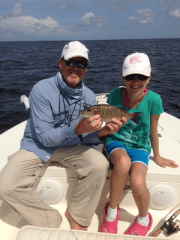 “My dad and I had a lot of fun fishing with you last week! I can’t believe all of the different kinds of fish we caught: mangrove snapper, jack crevalle, topsail catfish, ladyfish, & sea trout. My favorite ones were the jacks and the catfish! We look forward to fishing with you again in the future”.